So the dilemma is … do I or do I not? This is the question? I refer to what to do for the best when you’re out of the office for a period of time. I would normally set an Out of Office on my emails when I go to a conference or go on holiday, but I get so much spam emails and I think every time I set my auto responder I end up getting more. So some of you may be aware that earlier on in the week we flew out of Manchester Airport for the A4U Expo conference in Munich. The trip didn’t start too well as there was a chance that the returning ash cloud over the UK could have affected our flights, but what actually happened was that Manchester airport was open on Monday when we were due to fly, but had been closed on Sunday. When you have booked a flight in advance, checked in online and made your seat reservation you’d expect that it would be an easy process to get to the airport, drop your luggage off (couple of minutes) and then go through security and to the gate. Since Manchester airport had been affected by the ash cloud there was obviously more people trying to get a flight, but it seemed like chaos had moved in. At the baggage drop off point there were people delaying the queue trying to rebook a seat on a later plane. Surely there should be a separate desk for this type of thing? Then when we finally got the bags checked in, the queue was out of the security area and was making its way past the check in desks. Getting ready to attend a conference with Dave takes quite a lot of organisation and planning. It was back at the start of the year that the plane tickets were booked for Munich on Monday, and over the last few weeks Dave has been getting his presentation sorted for his first session on Day 1 (with a little help from myself and the team) and I’ve been getting all the plans in place to leave the kids at home with grandparents and leave the guys at the office. After yesterday’s post that went on for a while, this will be a short one. 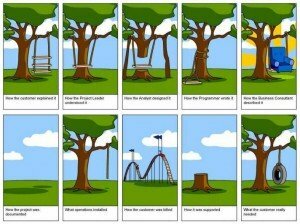 I found this cartoon and its perfect in how it demonstrates the different expectations from the different stakeholders in a project. Fortunately at Bronco we don’t have that many links in the process and it’s just me communicating directly with the clients and then directly to the development team, so we tend to get it right from the start most of the time, as long as the client has stuck with the original plan!